So where are biopharma companies today in their digital journey? What are digitally maturing companies doing differently? What is holding the industry back from evolving digital capabilities? Developing the digital strategy—Where to begin? The biopharma industry’s commitment to digital transformation is increasing; companies are thinking about how to organize their digital activities, and some are hiring chief digital officers (CDOs), often with experience in other industries, to lead transformation efforts. That said, we anticipate that the transformation may pose some challenges to biopharma companies, especially in overcoming cultural barriers. Biopharma ranks somewhere in the middle of industries in digital maturity and adoption of flexible and adaptable leadership and learning models, above manufacturing, financial insurance companies, and government, but behind IT, entertainment, and telecom. While many biopharma companies are experimenting with digital, most are yet to make consistent, sustained, and bold moves to take advantage of the new capabilities. The majority of companies that responded to the survey are either in early stages of the journey (25 percent) or developing their capabilities (55 percent); only 20 percent report themselves to be maturing. These levels reflect how respondents grade their companies in response to the prompt, “Imagine an ideal organization utilizing digital technologies and capabilities to improve processes, engage talent across the organization, and drive new value generating business models.” The rankings were on a scale of 1 to 10, and the three maturity groups were early (1–3), developing (4–6), and maturing (7–10). Even though most biopharma companies are still developing their digital capabilities, 58 percent say that digital is a top management priority and 79 percent expect to realize the value of digital initiatives within the next five years. Digitally maturing companies differ from those in the earlier stages of digital maturity in the way they apply digital, scale learnings, collaborate, and facilitate change. Digital technologies can make existing competencies work more efficiently and allow companies to explore new ways of doing business. 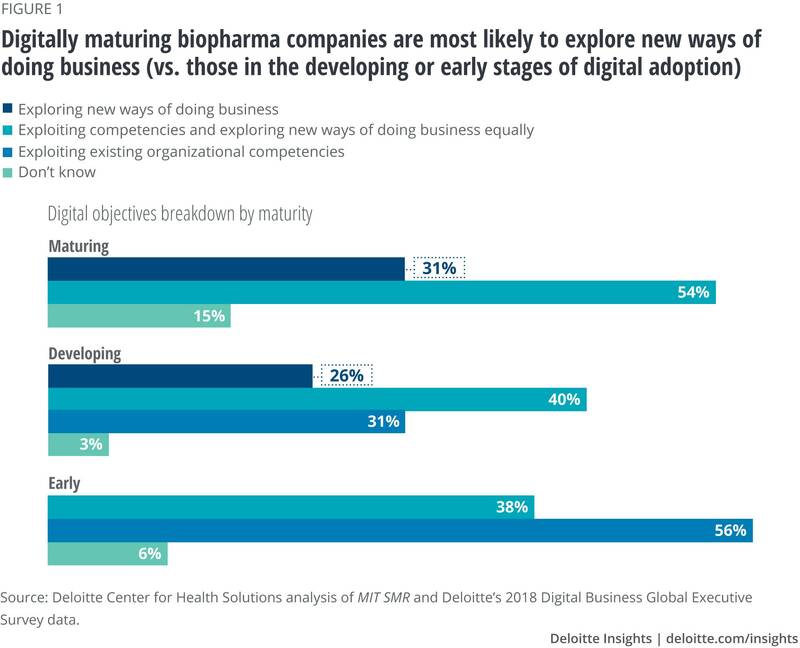 Survey results show that among biopharma companies, a greater percentage of digitally maturing companies are exploiting new ways of doing business, compared with companies that are in the early phase of digital maturity (figure 1). Digitally maturing companies also implement digital initiatives in stages, establishing pilots and taking a measured approach to scaling initiatives based on lessons learned. While 62 percent of digitally maturing biopharma companies report scaling up successful initiatives to drive digital transformation across the organization, this is true for only 38 percent of those in the early stages. Digitally maturing companies also foster a culture of adaptability and consider lessons from success and failure equally valuable. Furthermore, they are more likely to encourage feedback and share results from failed experiments in ways that facilitate learning across the organization. 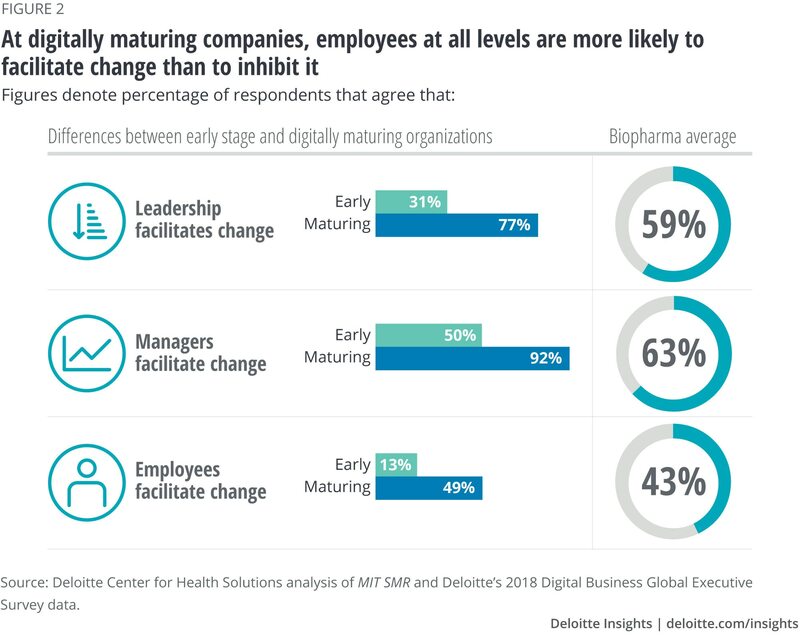 Digitally maturing biopharma companies also recognize that driving change through leadership is not enough; instead, they encourage change at all levels of the organization. 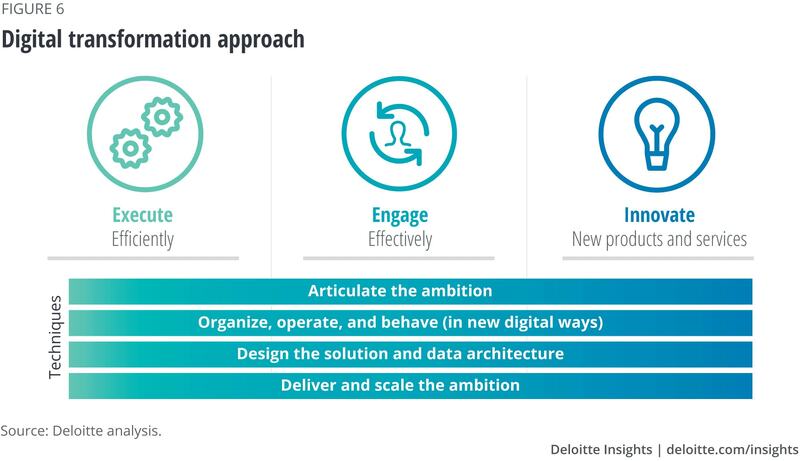 Moreover, individuals at all levels of digitally maturing companies are facilitating change more than their counterparts at companies in early stages of digital adoption (figure 2). Collaboration is also a differentiator. Digitally maturing companies are increasing and encouraging collaboration internally, especially across functions, more than early-stage companies. They are also more likely to collaborate externally (with business partners and customers) than companies in the early stages. This is especially important in biopharma, in which emerging data sources are likely to come from external stakeholders including hospitals, physicians, health plans, and patients. The survey sheds light on several factors that may be holding biopharma companies back, including lack of a clear vision and leadership and funding for digital transformation. 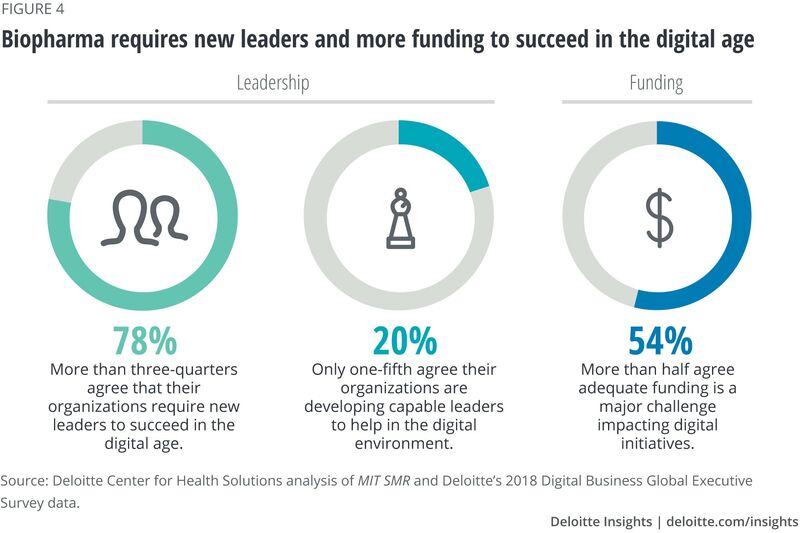 Though over half of the companies say that digital investment is a priority for their leaders, they also say they would like leaders to provide a clearer vision and purpose for their organization’s digital investments. Without this, companies may end up being distracted by the “shiny object” syndrome— shifting focus based on topics they hear about from media or competitors. Figure 3 shows more of the survey’s findings regarding what biopharma employees want most from their leaders. On leadership, more than three-quarters of biopharma respondents (78 percent) say their organization needs to find new leaders to succeed in the digital age, and only 20 percent think their companies are effectively developing the type of leaders who have the capabilities necessary to lead the organization in a digital environment (figure 4). Interestingly, some digitally maturing biopharma companies have recruited chief digital officers (CDOs) externally, often from the retail and fashion industries, perhaps with the expectation that they will provide fresh perspectives to typically conservative and risk-averse companies. One CDO in particular has leveraged his fashion industry experience to change the approach to patient engagement. He structured his team like a magazine outlet, hiring editors, librarians, and copywriters to run a digital campaign. Funding is also an issue, according to the survey: Fifty-four percent of respondents agree that adequate funding is a major challenge for digital initiatives (figure 4). Opportunities for digital transformation are available throughout life sciences organizations’ business, from business operations such as production and enabling functions to engagement with patients, physicians, health systems, and payers to developing new products and services. Realizing each opportunity requires the capabilities of a digitally maturing organization, including an overall strategy, culture of collaboration and experimentation, and supportive leadership. For instance, digital consumer platforms (as described below) can leverage ecosystem relationships and partnerships that have a much larger impact than a single organization (figure 5). Digital can help companies execute better by improving performance and reducing costs through collaboration, centralization of digital technologies to streamline delivery, and enhanced capabilities across the organization or division. Supply chain. A global biopharma company is experimenting with virtual reality in its manufacturing operations. By creating virtual training programs that mimic aseptic production environments, managers can cut training time in half and speed up the path to proficiency. Smart glasses and augmented reality can also capture video, which helps eliminate manual recordkeeping and reconciliation. This may also enhance operational capacity as well as quality review and approval. Streamlining marketing efforts. Another biopharma company cut 20 percent of its marketing base costs by setting up a global marketing system. This move followed an analysis of creative duplication, in which the company found that up to 60 percent of localized asset creation activities were duplicative. The centralized content development hub it now has can provide standardized marketing material in flexible formats to over 40 local markets. Acquiring talent more efficiently. A health care company used to check nurse applicant licenses twice during the interview process to verify a candidate’s ability to practice in the assigned state. This involved going to a verification website, taking a snapshot of the candidate’s license, and storing the information in their applicant file. A human resources “bot” was able to automate 80 percent of the process, resulting in 65 percent lower labor costs and reducing the risk of errors. It freed up one full-time equivalent worth of work, allowing for staff to focus on higher value activities. Digital can help companies deliver a differentiated, engaging, digitally enabled impactful experience to key customers, the workforce, and ecosystem partners. Key elements include using digital platforms to engage patients and other stakeholders remotely, leveraging social and other community networks, and personalizing experiences with user data to deliver greater value. Creating a platform for customer experience. PatientConnect (Deloitte’s patient services and care management platform) delivers consistent, high-touch patient experiences across channels and enables adherence to treatment and care coordination with each patient’s full network of care providers. Through connected apps and devices, PatientConnect supports digital therapy, helps improve patient outcomes, and helps health care providers coordinate to manage patient care. The platform analyzes internal and external data to gain insights into patient treatment and interactions and can integrate with ConvergeHealth’s Miner platform for analyzing real-world evidence. Connecting patients, biopharma, caregivers, health care providers, and other stakeholders. ConvergeHealth by Deloitte’s Connected Patient Ecosystem helps biopharma companies build partnerships with advocacy groups and providers to enhance the experience of patients with complex, chronic, and terminal diseases. It supports a next-generation digital health care network focused on patient support and digital engagement. Patients who consent to sharing their data receive information and updates from the sponsoring organization (typically biopharma companies and patient advocacy groups) to help navigate their disease. Optimizing the content provided to health care practitioners. A large global biopharma company has built a self-service portal for over 30,000 practitioners across Europe to access marketing and sales content across a variety of media. The content shared with each practitioner varies depending on previous viewing habits, enabling customized targeting and improving the effectiveness of the marketing approach. Developing and delivering a holistic digital strategy is not an easy task. For some, the word “digital” seems to have evolved to mean nothing and everything at the same time. And there is a tendency to manage digital initiatives in ways that take the form of projects or are limited to activities within a given division or function. Life sciences companies that want to move away from that tendency need to develop a digital DNA by which a company’s digital activities, people, culture, and structure are aligned with the organization’s broad ambition. The strategy and roadmap should explain how initiatives form platforms that create real value in the short-term and long-term. That goal requires seeing differently, thinking differently, and doing differently. Top down. Develop a corporate ambition and vision, and then decide what needs to be done to make that vision a reality. Bottom up. Select use cases across domains and use them as the foundation for the overall digital strategy and roadmap. A use case, for example, might include chatbots that can interact with patients and provide real-time support, or master data that is managed through distributed blockchain. Other examples could include cross-study clinical data wrangling, automated adverse-event processing, and the ability to track equipment performance over time using sensor data and analytical models. Horizontally. Pick a key business problem or process and use it to identify potential transformation opportunities (e.g., a patient journey, a regulatory approval process). Regardless of the approach, if done correctly, digital transformation can allow life sciences organizations to more effectively use data for making decisions on how to run the existing business and position the organization for the future. Life sciences organizations should start with determining and articulating their ambition (figure 6). Practically, this means prioritizing initiatives, anchoring decisions, and focusing on the future. These capabilities can improve the speed and effectiveness in meeting objectives. After articulating the enterprisewide ambition, leaders should adapt operating models and culture, implement technology, and scale solutions (see figure 6). 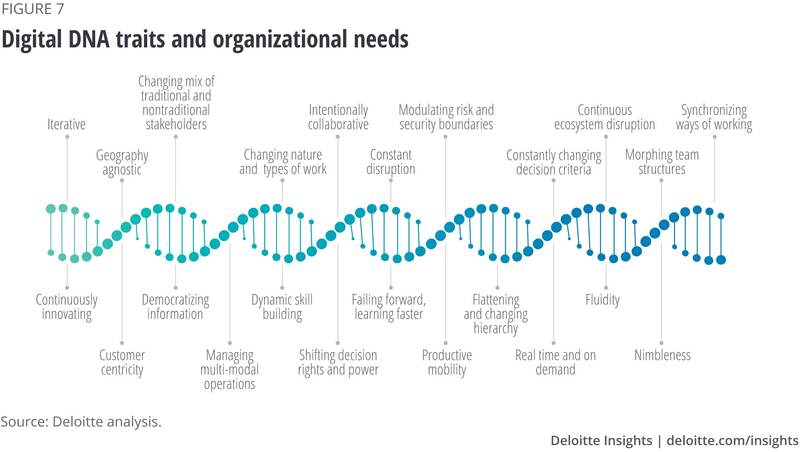 Digital DNA is a set of 23 traits—identified through research—that organizations can adopt to become more digitally mature (figure 7). Life sciences organizations can use Digital DNA to guide the tactical actions that are needed to bring about transformation. Understanding patients, customers, employees, and ecosystem partners can give life sciences companies insight into unmet needs, motivations, concerns, and drivers. These insights—combined with an understanding of data types and sources, technical capabilities, and business objectives—can help companies transform lofty ideas into well-balanced concepts that are ready to pilot, scale, and launch. Iterative testing of these ideas, paired with rigorous proof of concepts, should minimize risk without curtailing innovation. In this highly iterative phase, conducting design-and-test sprints to gather feedback quickly from users and other stakeholders helps refine the Minimum Viable Offering (MVO). The MVO is the solution that has the fewest features needed to satisfy partners. It also allows the use of prototypes to test concept desirability, feasibility, and viability, before outlining the MVO solution in preparation for launch. Building, launching, and delivering on value propositions is the final step before ideas can become reality. This step takes the MVO through detail design and development, delivering components of the concept, and determining whether the business is ready to deliver it. This should include operational readiness assessments and a deployment strategy. Feedback from the market and users and adoption tactics monitoring will further inform how and when to release the MVO. Delivering just-in-time drugs and other personalized therapies. Although life sciences companies today may already be doing some of this, the future will focus on these competencies to a much greater extent. Investment in digital technologies and the organizational transformation needed to realize their promise is critical for not only success but for survival. Mike Standing is Deloitte's Life Sciences and Health Care industry leader for the Europe, Middle East, and Africa (EMEA) region. He is based in London, UK. Greg Reh leads the DTTL Global and US Life Sciences practices for Deloitte; in his role with Deloitte’s US member firm, he leads the Life Sciences Sector practices for consulting, audit, tax, and financial advisory services. He is based in Philadelphia, PA. Dawn Anderson, Jonathan Fox, and Natasha Elsner, Digital R&D: transforming the future of clinical development, Deloitte Insights, February 14, 2018. Gerald C. Kane et al., Coming of age digitally: learning, leadership, and legacy, MIT Sloan Management Review and Deloitte Insights, June 5, 2018. Anderson, Fox, and Elsner, Digital R&D. 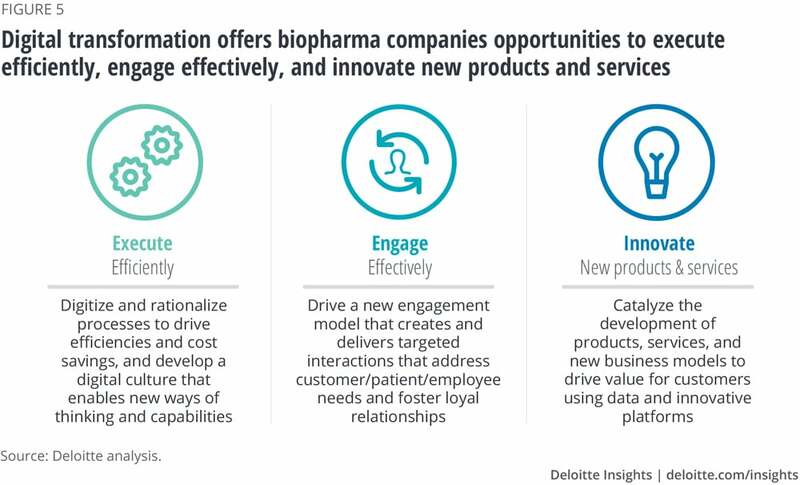 Brett Davis, Jeff Morgan, and Sonal Shah, Mission critical: Biopharma companies are accelerating real-world evidence adoption, investment, and applications, Deloitte Insights, June 28, 2018.